BOA has recently supplied a replacement expansion joint for the MIRO Refinery in Karlsruhe as part of its’ 2015 turnaround programme. The MIRO (Mineralölraffinerie Oberrhein) refinery in Karlsruhe is Germany’s largest fuel refinery and one of the most modern and important refineries in Europe. With an annual production of around 4 million tonnes of high value mineral oil products such as diesel, petrol, heating oil, propylene and bitumen the refinery is the most important supply source for mineral oil products in South West Germany. The BOA expansion joint is a critical component in the flue gas system of the FCCU (Fluid catalytic Cracking Unit) which allows refineries to use their crude oil resources more efficiently. 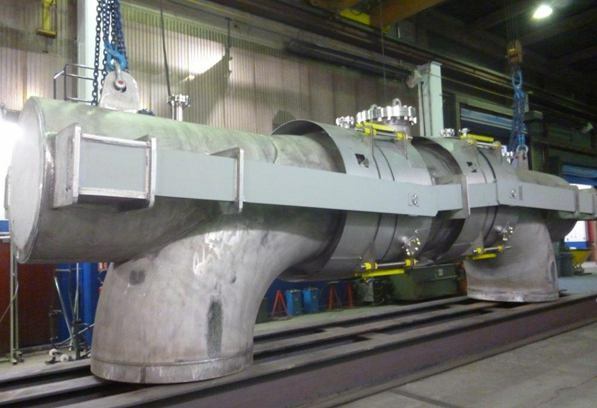 Designed and manufactured at BOA SFZ, the BOA Groups specialised facility for large expansion joints, at Chassieu in France, the unit is 9m long, 3m high and weighs approximately 20 tonnes. Sophisticated engineering design techniques were used to ensure long life and reliability of the unit. The expansion joint is designed to operate at temperatures up to 780°C and gas pressures of up to 3,6 bar and was manufactured from specialist nickel-based material and a special heat resistant alloy that were specifically produced for the contract.